Might try eating lemon juice, see if that prevents it. Is there nothing not covered here? My pre-op urine tests (sample taken with a catheter) last Tuesday showed, “hazy” urine and “many” Squamous Epithelial. Doctor said that it might mean a urinary infection and he prescribed the antibiotic SMZ-TMP DS twice a day for three days. Then a follow-up test next Tuesday. I won’t eat anything the morning of the test, but I wonder what you guys think I should eat the day before to make sure this condition isn’t caused by something I ate? This site, http://www.buzzle.com/articles/squamous-epithelial-cells-in-urine.html, says that squamous epithelial cells are a result of contamination of the urine sample by skin flakes. Therefore, nothing to worry about. They say to avoid contamination, give your sample in the morning, and start collecting midstream, i.e. let the first bit go in the toilet. Thanks. It’s getting so I can’t remember life before the PHD. Thank you for the wonderful blog and easy to read information! I am very happy to learn that rice (and potatoes) are safe starches to eat! It means I can go and make traditional nasi goreng (Malaysian fried rice) again mee hoon goreng (fried rice noodles). A quick question regarding asian type of noodles. I recently bought some vermicelli type noodles and it’s made out of bean starch ( I think it’s mung bean). Is it OK? Or is it better to get rice noodles. They don’t seem to sell rice noodles at the supermarket here in Tokyo where I live at least. I think rice noodles are better. Beans have a lot of toxins in their raw state. They can sometimes be detoxified by overnight soaking and thorough cooking. With commercial products we don’t really know what they did to process the beans. Personally I avoid legume/bean products and stick with rice. I’m sure you can find rice noodles in Tokyo! Paul, thank you very much for the prompt response! Yes, I would have thought that rice noodles could be found easily in Japanese supermarket, but no. The traditional noodles here are udon and soba. Not that ideal for me because udon is wheat and soba is buckwheat (majority is a mixed of both wheat and buckwheat). I understand buckwheat is full of phytic acid, so I don’t eat soba, except when I make sourdough buckwheat pancakes (inspired from Stephan’s blog). Looks like I need to go and search for rice noodles at a Chinese shop. However, I found another type of glass noodles made out potato starch. Is it safe? I have been eating Paleo/Primal low carb for 1 and 1.5 years after giving birth to second child, and in recent months found that I actually feel much more satiated (albeit a little guilty) and feel full longer if I eat a little more carb like rice or potatoes, so I am extremely glad to have found your blog that says these are OK. So relieved that I don’t have that guilt baggage anymore following the conventional low carb eating. Again, thank you so much for the brilliant research. I love the way you write, so scientific and yet so eloquent and easy to read that a layman like me to understands. Thanks! I think it’s even more important for women to eat starches than men. They may sell rice noodles as Pad Thai noodles or rice sticks. They must be available. I would like to know the toxin content of squashes and gourds. These are eaten quite a lot by tribal people around the world. I would love to try them. Do you have any information about them? I don’t have specific information but I think toxin levels are low. In general, fruits are low in toxicity, and low-calorie shelled plant foods are low in toxicity. So I would hold them innocent of all sin until evidence turns up otherwise! Last night, I watched Alton Brown’s beyond excellent show, “Good Eats,” featuring Asian noodles. He doesn’t boil them, just soaks them in hot/warm water for 10-20 minutes, drains them thoroughly and uses them in whatever dish he’s making. This might do the trick for us. Both the CG and I like dishes with plain white rice better than trying to use rice noodles as a substitute for Italian style pasta. Asian noodles may look something like linguini, but they don’t taste like it at all. Clam sauce over rice is yummy, clam sauce over rice linguini not so much. That’s a great idea. Rice noodles cook so quickly, it’s so easy to overcook them. Cooler water might be just the trick. i am at the age of 27male with height 5.9ft & weight 50kg. is there any food supliment ya tips which will help me to get perfect bodyweight of 70kg. if any kindly provide me. If you’re healthy: Eat sufficient carbs and protein; perhaps 1000 calories total, around 600 carb and 400 protein would be good. Be well nourished (eg multivitamin, our other recommended supplements). This will promote bone density and tissue gain. Over-feed: force yourself to eat extra calories, with a focus on tasty and enjoyable food. Have extra dessert. Do resistance exercise. Take branched-chain amino acid supplements/leucine and perhaps creatine. Above all, cure any chronic infections. If the inability to gain weight is due to infection, then you’ll need diagnosis based on symptoms and tests. Fascinating. I’m glad that you got off the zero-carb diet – those are always unhealthy – and are doing well with more carbs. One thing to be aware of is that your response to very low carb dieting might indicate a parasitic (protozoal or worm) infection. You might want to ask your doctor to do a diagnostic test. 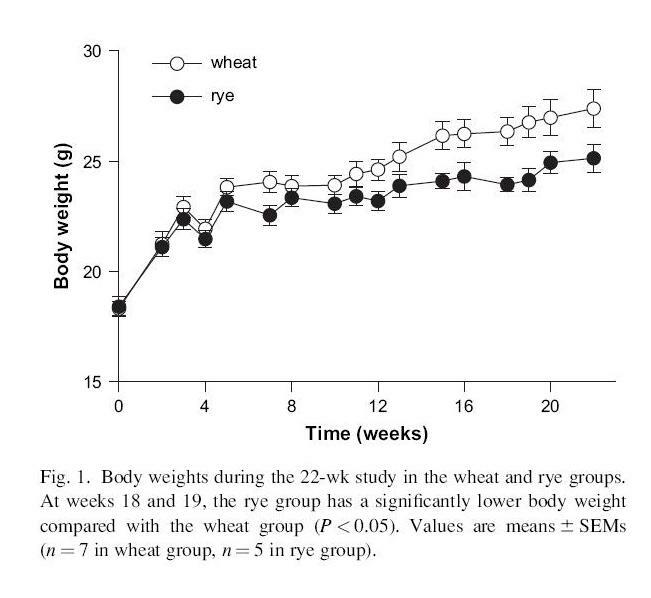 Paul, could you provide a (possible) mechanism through which fructose/wheat promote weight gain? Do they make people to increase their total calorie intake? Or do the operate on calories burning systems in the body (like the thyroid ot thermogenetic processes)? 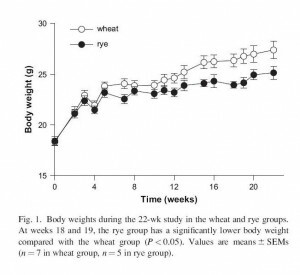 Would a person eating a diet high in fructose and wheat gain weight on the exactly same number of calories and the same activity level that won´t make him gain on a low toxin diet? I do not doubt your findings but I am interested in the mechanism! Fructose is a little easier, in combination with polyunsaturated fats it causes fatty liver disease which promotes obesity; also it is a “useless macronutrient” and I’ll blog about how that promotes obesity in the New Year. Wheat’s mechanisms are more mysterious. We need some research to help us with that one. Obesity is a multifactorial disease so generally the effects are greatest in combination with other factors. Gary Taubes says “what makes us fat is also making us sick”. To which I feel like adding, “even if it doesn’t make us fat”. Good line, George. I agree. By your logic, I should be overweight. There have been periods of time in my life where those oh-so-nasty legumes have composed at least anywhere from 20% to 30% of my calories; this corresponds to eating, for example, .25 to .5 pounds of black beans a day. And get this: I was drinking one to three 20 ounce bottles of sugar sweetened (not HFCS!) per day. During one of these periods, I went from very active to almost sedentary, which is always an excellent litmus test of whether a diet will induce weight gain or not. Guess what? No weight gain. Hence, in my anecdotal experience, your theory is incomplete. Yes, anecdotal experience matters: It can call into question ideas and theories by showing they are not not complete and lack the ability to explain every case. I’m not a fan of calorie-containing beverages, but if that’s what your digestive tract will tolerate, as a temporary measure it’s tolerable. Just keep omega-6 levels down…. You could also make your own drink with glucose flavor, eg rice syrup or tapioca syrup in tea or hot water with lemon juice. Interestingly, India (mostly North India) consumes a lot of wheat. And sadly, when people here are trying to lose weight, they often go for roti (wheat bread) instead of rice, thinking that they are somehow healthier.